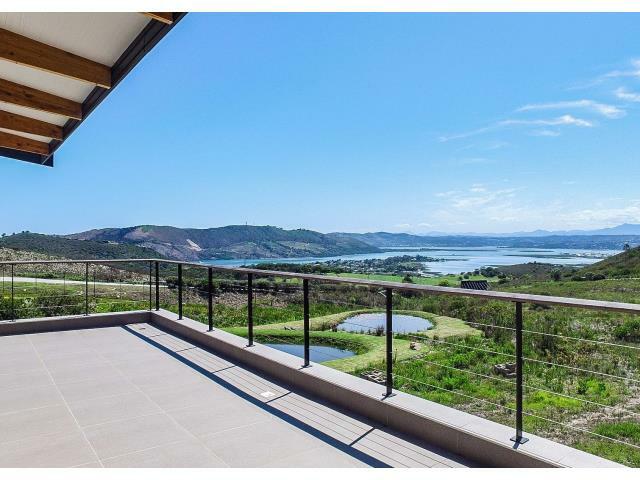 Modern, minimalist masterpiece in a magical setting (no transfer duty payable)"
Set in a fynbos nature reserve in Knysna, this brand new modern, minimalist house is designed to maximise the beautiful views towards the Knysna Lagoon, the Heads and the Outeniqua Mountains in the distance. Uniquely created for the modern family, the house offers spacious open-plan living with stacking doors that open onto the large undercover patio with built-in braai. The two en-suite bedrooms are sunny, bright and spacious and offer ample storage. A well-designed study nook maximises the natural light and stunning views of the fynbos. The modern kitchen forms part of the living spaces and allows easy access to the outside braai and undercover patio. The interior creates a feeling of uncluttered luxury with contemporary finishes and state-of-the art comforts. The exterior of the house boasts beautiful natural stonework, wood, steel and glass. The nature reserve has magnificent fynbos and indigenous plants and offers a walking trail of 3,6 km for the residents. The reserve covers 48 hectares of which only 10 hectares may be built on. The levy is a mere R 400 per month as there are no communal buildings to maintain - except the guard house at the main entrance. This is the perfect house for owners who want a uniquely-designed modern home in a safe and tranquil nature reserve close to two golf courses and other sports facilities. Knysna's private hospital is a few minutes' drive away; so too is Bollard Bay Beach, the Knysna Heads ... and all other attractions that Knysna offers. It makes sense to invest in Fernwood Private Estate right now as local and foreign investors have realised the uniqueness of this low-density estate and have already started buying, and building, in Fernwood. No stand or house has yet been made available for resale by owners, resulting in a very strong demand for the fast-selling properties. The good news about Fernwood Private Estate does not end here! Further good news is that buyers will not pay transfer duty on property in Fernwood as they will be buying directly from the developers!